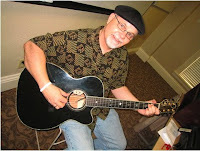 Many thanks to all of you that came out to DSA "Gary Nicholson Songwriter's Workshop" on Wednesday, June 24th and made it a great success with an overflowing crowd of 35 people. You can download your pictures with Gary from here. A couple of videos have been posted on YouTube as well.